Most people use their Fitbit tracker to monitor their daily activity, but this chronically fatigued person tends to use hers to monitor her sleep… which seems to be as abysmal as my activity levels! 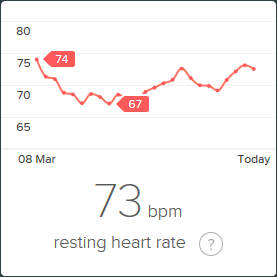 If you’ve not heard of Fitbit (where have you been?! ), they do a range of activity trackers to help monitor and boost your fitness. Obviously, the more you pay the more you get. They range from the Fitbit Zip (activity tracker) and Fitbit One (activity & sleep tracker) up to the Fitbit Blaze (smart fitness watch) and Fitbit Surge (fitness super watch). I used the Fitbit One for a while, but I’ve now got a Fitbit Charge HR (heart rate and fitness band). The Fitbit Charge HR sits on my wrist and acts as a watch whilst monitoring my activity and sleep. When I’m near my laptop (or have Bluetooth on my phone) it uploads the data to my Fitbit account and kindly displays it in graphs for me to make sense of. All I have to do is remember to charge it every few days (via USB). The Fitbit account does a lot more than show you your data, you can log your food intake, link to friends and so much more. 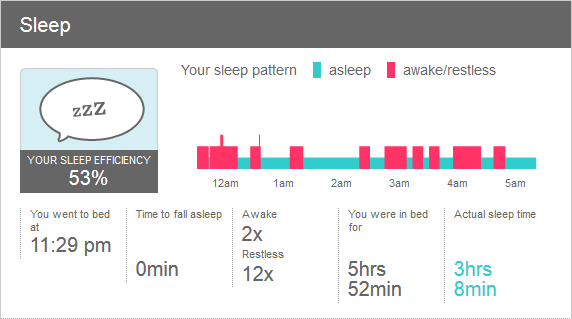 Last night I had the best sleep I’ve ever recorded using the Fitbit. I rarely get anywhere near 80% sleep efficiency or the recommended 8 hours sleep. As you can see from the graphics below, I don’t get anywhere near as much sleep as I should. I tend to average between 50% and 65%. Activity-wise, I’ve found that I’m most active on my days off work (which isn’t surprising as I work in an office). In fact, I’ve discovered that I get the most activity done on a day out shopping (over 10,000 steps – the recommended daily target) or a trip away (over 20,000 steps, but I pay for it afterwards). So… Shopping and trips away may not be good for your bank balance, but they’re good for your health! The data gathered by the Fitbit is great, but apart from trying to up my step count and sleep better, I really don’t know what else to do with the data. Still, I do find it interesting. Fitbit do have a premium account which gives more indepth data analysis and a Fitbit Trainer etc, but I’m really not active enough and can’t afford to put money into something like that. Do you have a Fitbit or similar activity tracker? Tagged activity, data, fitbit, sleep, tracker. This is really informative! I’ve been looking into maybe getting a fitbit for a few different reasons. Tracking my sleep is definitely one of them. I love my FitBit! The analytics are so interesting to me. I’m always checking my stats and comparing it to previous days, weeks, months! 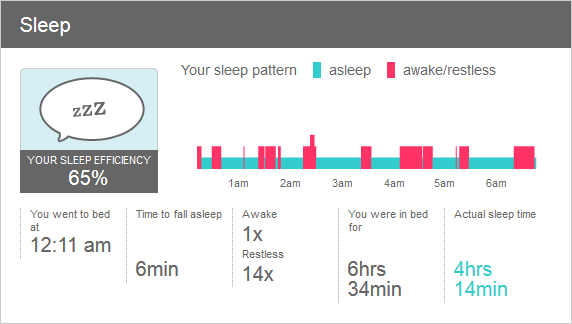 I have a fitbit flex and like you, it’s the sleep stats which interest me most as I’m often awake during the night. I do intend getting more active though so I’m sure it will come in very handy when I do. Years ago, when the 10,000 steps idea began, I used a pedometer to track my activity. At that point in life, I rarely failed to meet the goal. With two dogs to walk, I walk well over the target number of steps every day… Better than the gym! I’ve always wondered how the Fitbit works so thanks so much for sharing the pictures and details. Don’t have one but have been thinking about getting one. Thanks for the details. The most I’ve ever done is wear a pedometer. I think if I had access to all those stats I would just worry about them! I seldom go to bed before 11:30pm and I am always up by 5am. Factor in the restless nights I have, when I can wake 3 or 4 times and I firmly believe that I must have sleep deprivation for most of the time. I very rarely sit down at work and in the evening I tend to do all my jobs before relaxing, as to take a short break when I first get indoors would be fatal! I don’t know where I’ve been, but I’ve not heard of Fitbit, but now that I have I know I could do with one! I have the Fitbit One – thats the clip-on version, which means it can be hidden. I use it all the time and also do some of those Workweek Hustle and Weekend Warrior challenges with a few friends – sometimes the results can be surprisingly close! 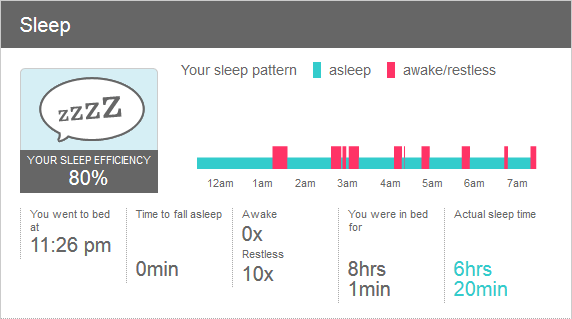 I must confess I don’t very often use the sleep function, I think I sleep soundly enough without worrying about it! I’m actually on my second fitbit because the original one stopped synchronising are about a couple f years!